Fiat Chrysler stays “in the game”, by continuing to introduce an upgraded lineup of Jeep SUVs and crossovers. I drove the second generation Jeep Compass, which is outperforming and outselling the previous generation model. 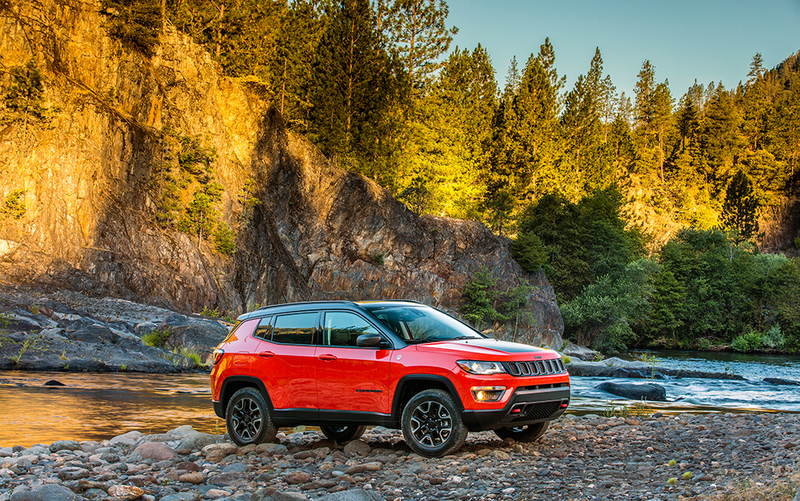 The 2018 Jeep Compass, which was redesigned in 2017, is positioned between its larger sibling the Grand Cherokee, and the smaller Jeep Renegade. The pearl red 2018 Jeep Compass Trailhawk 4×4 that I tested has a fresh new appearance, advanced technology, and improved on- and off-road capability. It is powered by a 2.4-liter I4 engine that generates 180 horsepower and is paired with a 9-speed automatic transmission. Crossovers, like the Jeep Compass, are outselling sedans now that they are competitively priced, have car-like performance and the ride height of a small SUV. The Compass also averages 22 mpg city and 30 highway. By August 2018, sales of the new Compass were up 75.6% with over 116,149 delivered compared to 79,511 for the previous model during the same period, according to Wards Auto. The Compass Trailhawk is also loaded with standard equipment, including off-road suspension, a select terrain system, select park brake, hill descent control, speed sensitive power locks, rear back-up camera, and advanced multistage front airbrakes. Interior features include the Fiat Chrysler Uconnect with a 8.4 inch display, Google Android and Apple CarPlay, leather wrapped steering wheels , 6 speakers, and more. Optional equipment can include a cold weather package, heated front seats, advanced safety and lighting, lane departure warning, blind spot monitoring, cross detection, and GPS navigation. The base price on the 2018 Jeep Compass Trailhawk 4×4 is $28,795 MSRP. The price as tested was $34,910 MSRP.